Summary of outcome from the Council Meeting held on 27 March for your information. All councillors supported the following resolution this evening..
2.1 Receives and considers all submissions on the draft Port Melbourne Urban Design Framework. 2.2 Acknowledges the covenants and current planning controls affecting the site at 1 - 7 Waterfront Place. 2.3 Undertakes further strategic work in accordance with the resolution of 13 March 2012 to review the draft UDF, in particular the draft Vision and Principles and the Waterfront Place Precinct section. 2.4 In preparation for the possibility that the covenants are varied, removed or deemed not applicable, undertakes further strategic work in accordance with the resolution of 13 March 2012 to prepare detailed design guidelines for the property located at 1-7 Waterfront Place that will reflect the Waterfront Place Beacon Cover Design Guidelines October 2009 [MGS Architects 2009] and in particular will not exceed the recommended building envelope and height controls. 2.5 Acknowledges that the detailed design guidelines will inform the review of the Waterfront Place Precinct. 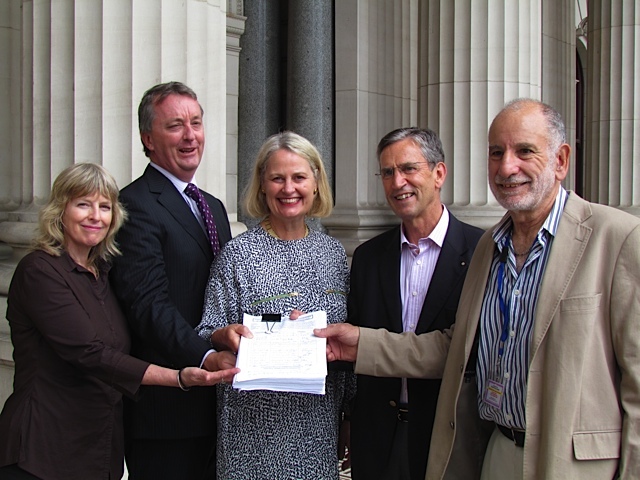 2.6 Reaffirms the request that a report be provided to Council in April detailing the proposed process for engaging with the community in the preparation of revised Waterfront precinct and site guidelines, including the opportunity for stakeholder forums with representation to include community groups, the Port of Melbourne Corporation, the business association, local business operators, Yarra Trams and the owners of the freehold sites. Commentary and summary: The essence of this resolution is that while the covenants and the planning controls governing the Beacon Cove development remain in place they are to be respected. However, in the event that the covenants are varied, removed or deemed not applicable' [see 2.4] Council's position is that adopted in October 2009 based on the report of MGS Architects. All future work in the precinct is to be guided by this report. Our first social get together for 2012 has been arranged for the evening on Wednesday 28th March. Nautical Restaurant at 3 Station Pier will host the evening. It would be great to see you all. Your friends and neighbours are most welcome. Lots to chat about and an update on where we are with the Port Melbourne Waterfront Urban Design Framework will be provided. Please make your booking as per below. The cost is $50 per person for a 3 course dinner which includes antipasto and dips at the start, a choice from 4 mains - beef, fish, chicken and vegetarian, and a choice from 3 desserts. A complimentary glass of wine shiraz/cabernet or Semillon/Sauvignon Blanc is included. This morning there was graphic demonstration of “tri” partisan support to retain the community amenity at the disputed Port Melbourne Triangle location, the seaborne tourist gateway to Melbourne. Beacon Cove Neighbourhood Association President, Mr Eddie Micallef, along with other community leaders presented petitions to members of Parliament on the steps of Parliament House asking for protection to the existing facilities, view lines and residential services. Any substantial development will also impact Station Pier and its shipping activities of the Tasmanian ferry and the Cruise Ships. The BCNA is calling on the City of Port Phillip, with the aid of Parliament, to amend the Draft UDF Report to reflect the aspiration of local residents and the broader Victorian community. Please find below a copy of the media release issued by the City of Port Phillip for your information. 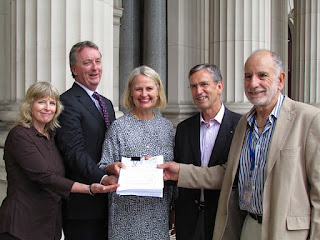 We have made a submission to the City of Port Phillip, and attached a copy of the signed Petition. The Petition contained 1139 signatures. Thank you for all your input, feedback and support. We have attached a pdf version of our submission. Click on BCNA Submission to the Port Melbourne Waterfront Urban Design Framework December 2011. If you collect more petition signatures after 7 March; these are still very important so please continue to pass them onto the BCNA. Submissions on the Port Melbourne Waterfront Urban Design Framework close 9 March. Click here for a scanned copy of the brochure which contains all details re booking and information on the film. Please be advised that on 5 March, Station Pier will welcome Queen Mary 2, the Cunard flagship, at Station Pier. Queen Mary 2 is scheduled to be berthed at Outer West Station Pier from approximately 0730 to 1800 hours. This visit is likely to generate public interest, and other operations, including morning and evening Spirit of Tasmania sailings, are scheduled for that day. Port of Melbourne Corporation (PoMC) has traffic management plans in place to manage anticipated increases in vehicle traffic in the area, however higher than usual traffic volumes may result in some localised congestion. To find out more please contact Port of Melbourne Corporation on 03 9683 1565, visit our website or email a member of our Community Relations team. *Please consider the environment before printing this email advice. Your Opinion Counts! Ensure your voice is heard! Welcome to autumn - and the weather! This rain and wind is piling up the garbage along our beaches. GOOD NEWS - this Sunday is Clean Up Oz Day. 3207 Beach Patrol will be out in force - and enjoy the satisfaction of this social occasion in collecting this litter for proper disposal. Zone 4 - Sandridge Life Saving Club. 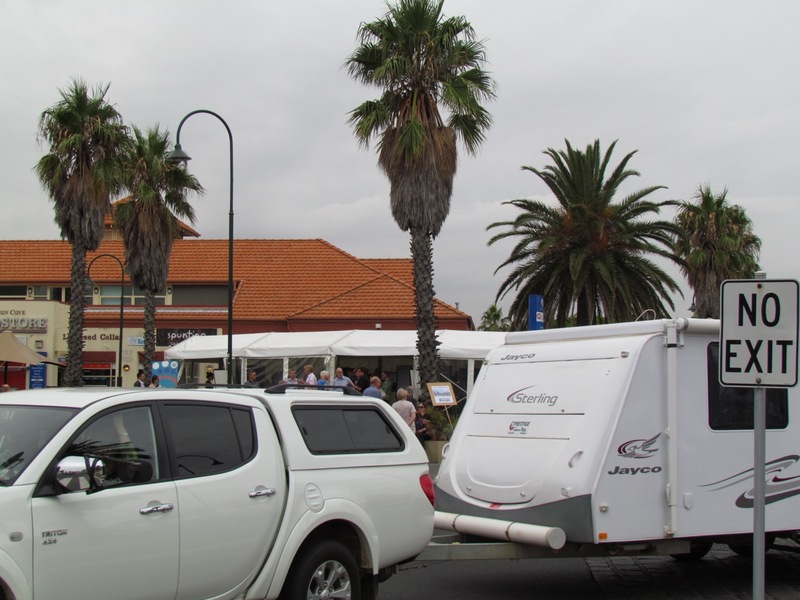 at the end of the clean we will gather as usual at the Beacon Cove Food store (tram terminus) for coffee and chats. We have requested favorable weather for the morning! It was wonderful to see so many people at the community consultation session at Waterfront Place on Wednesday. Thank you for your support! To all the members and friends who are helping gather petition signatures, thank you. It makes a huge difference! Just to confirm if we could have all petition sheets with signatures back to the Beacon Cove Neighbourhood Association by 7 March. This will allow us to attach them in the BCNA submission to the City of Port Phillip which closes on 9 March. Over three hours yesterday afternoon, residents and visitors to the disputed Waterfront Place attended an information session with the City of Port Phillip Council staff and Councillors. 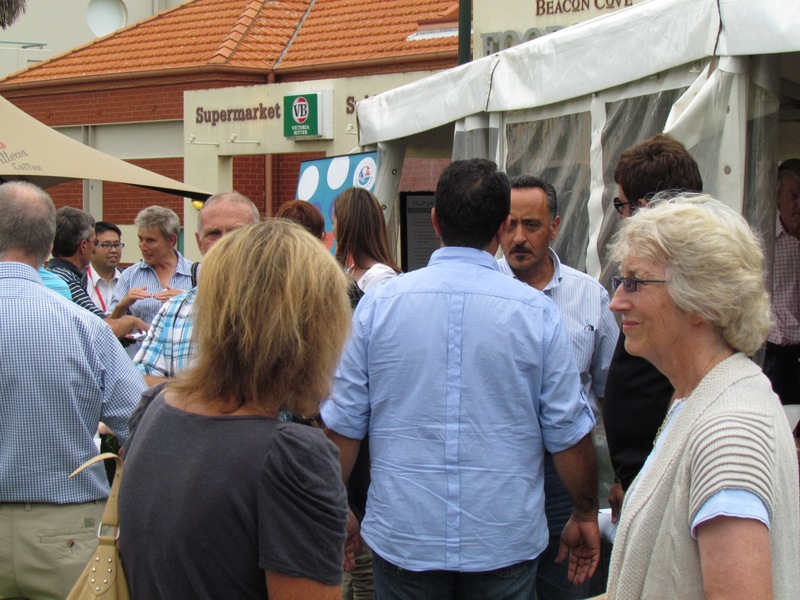 The Beacon Cove Neighbourhood Association set up its own information stall. The discussions took place as part of the Council consultation phase of the draft Urban Design Framework for the waterfront between Bay Street and Beacon Road. 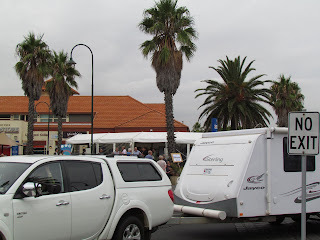 With passengers arriving at the 109 Tram terminus on the way home from work, and cars and campervans lined up in the roadway to board the Spirit of Tasmania it was a busy time. The attendance over the three hours was close to 200 people. Mr Micallef when addressing the gathered crowd went on to say “Not only will a large development on this site exacerbate the already frequent traffic gridlock at the entry area to Station Pier, but high towers will cast shadows and generate wind flows over the community meeting places and lose some of the soul that exists at this award winning planned development”. Any substantial development will also impact Station Pier and its shipping activities. The Association has now secured 100’s of signatures on its petition from people opposed to this overdevelopment and more are coming in daily. 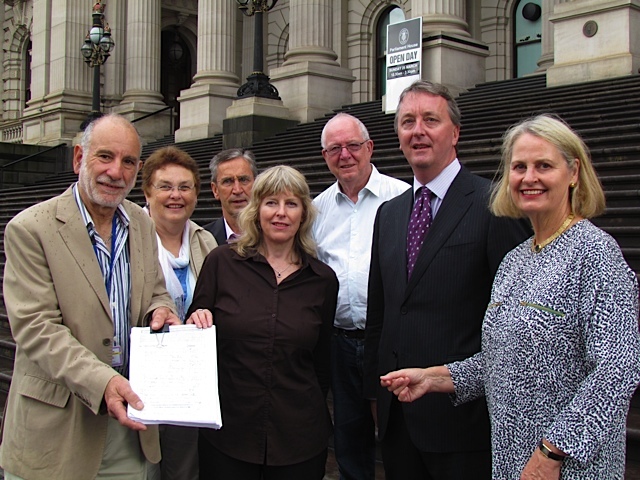 The BCNA is calling on the City of Port Phillip to amend the Draft UDF Report to reflect the aspiration of local residents and the broader Victorian community.